I used the fabulous Cool Day stamp set from Birdie Brown as my focal image. 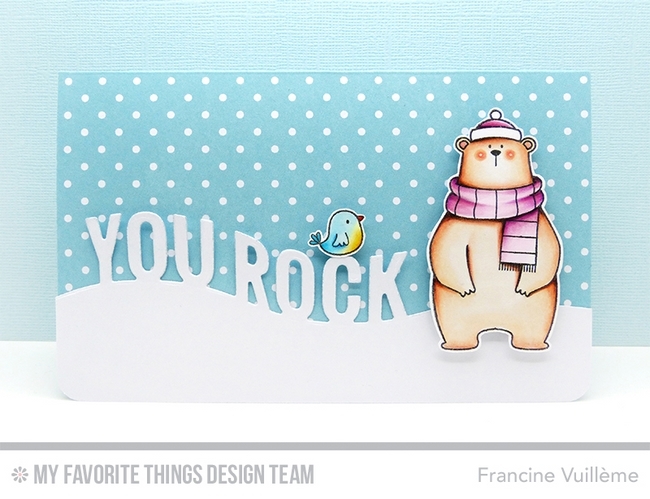 I created a scene using the die-cut word "You Rock" as a snowy hill. The word is from Blueprints 11. The cute bird is from the Harvest Buddies set. The patterned paper in the background is the perfect addition to this scene. It looks like a snowy sky! It’s from the Lucky Prints paper pack. I love it! The patterned paper does look like a snowy sky and makes the sentiment pop out. This is so cute! This is so adorable! Love the rolling hills with the sentiment and of course that sweet bear. I love this card! 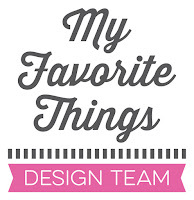 What a great combination of stamps, dies, and patterned paper! Francine--Adorable card! I love the whimsical little bird on the sentiment! Nice Touch! My grandchildren, or any family member or friend would love to receive this card! It's delightful! Such a sweet card, Francine! I love how you did the partial die cutting on the sentiment, and how the blue and white polka dots resemble a snowy sky...so clever! Beautiful Copic coloring, too, as always!